** Latest News ** P&DARCs competition on Sunday, March 3rd has been cancelled due to Total Fire Ban being declared. Back on February 16th a few of us assembled for our first indoor session of the year. First, a big thank you to Fernando for arranging the use of the indoor car park where he works. It is a decent size and well lit, with just a few minor breezes near the ends where the doors are. Ceiling height is a little tighter (and it is more solid) than out at Mullum - Mullum Stadium, but very flyable. And the 2pm to 5pm Saturday time slot is great. Oh, and we did have just one small obstacle in Fernando's bosses car that he had left there for the weekend. We managed not to hit it. You will also be pleased to know the venue comes with coffee machine, and 3 phase power for those hungry F3P batteries. 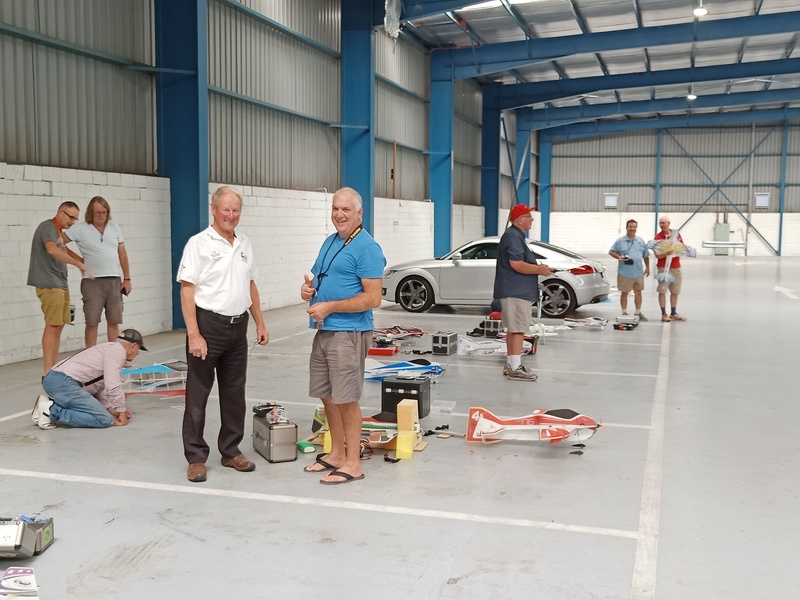 The stalwarts of indoor in Victoria turned up, and were joined be some new visitors in Norm Parker, David Creed and the Bloodworth family. 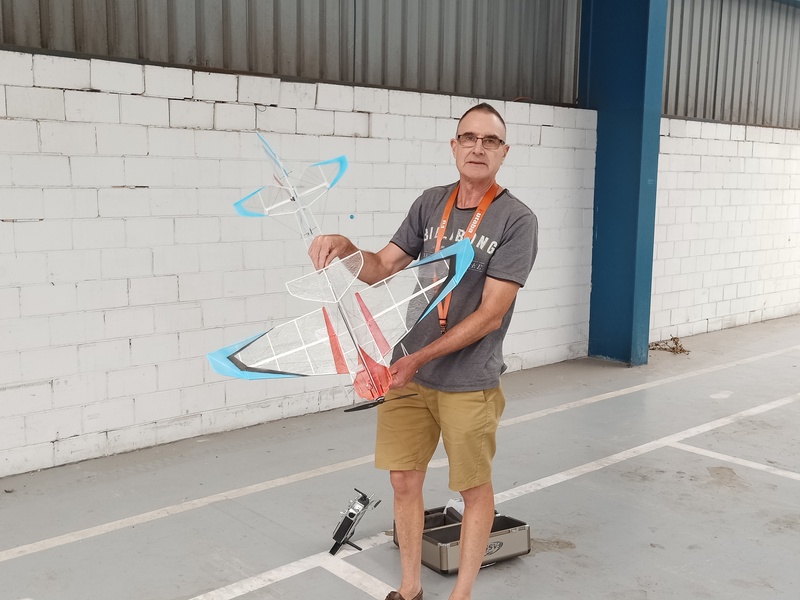 Both David Creed and Tom Bloodworth brought models, but technical glitches meant limited flying (or they were saving their efforts for the F3A competition at Nepean on the Sunday). Unfortunately Russell and Durwin couldn't make it. And Uncle Norm, in line with recent model swapping trends, was flying one of GlennO's models. We are getting a pretty good handle on air frames, motor, prop and battery combinations and will write up some notes separately. Mainly we have a variety of the 'Click' models from the early Evo's through to Dennis's NG - the later the best performer in the field - and a few of the Hobby King offerings which are great value for money. 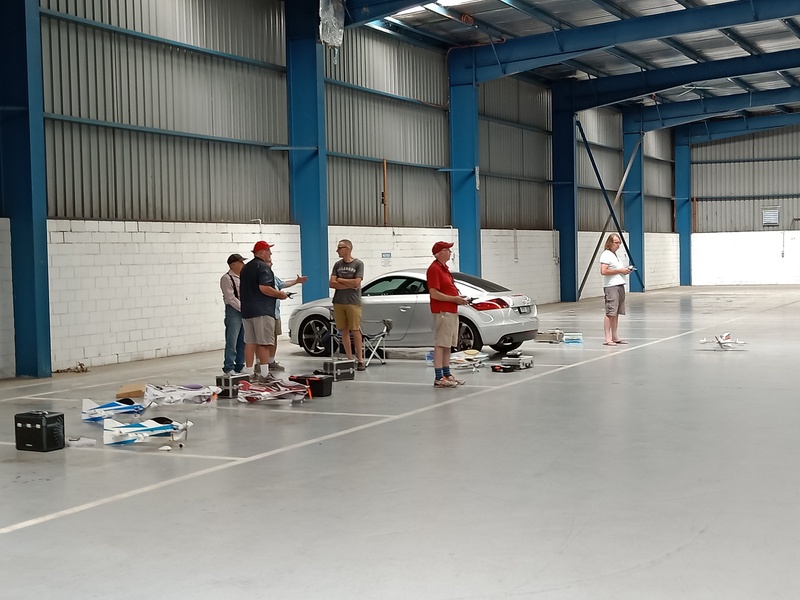 It has taken most of us a few sessions and the odd excursion into walls to get a sense of the indoor flying style and important use of rudder. Seems to be a necessary part of the learning curve. With that mastered the aerobatics can begin, along with quite a bit of precision hovering from Dennis. Overall it is a lot of fun and we will try to lock in a forward schedule of sessions so you can plan ahead.